Hot wax will be used as one of the dye-resisting agents. Adult supervision is required for children below 6 years old. Batik is a textile art where patterns are formed through a repeated process of applying dye-resisting agent, colouring and wax removal on a piece of cloth. Join us to learn fun facts (and misconceptions) about the art and rediscover the beauty of what Indonesian batik is all about. Jessica Alba wore it, Sehun of Korean pop group EXO sported it and what about you? And yes, your grandparents wear batik because it’s hip! 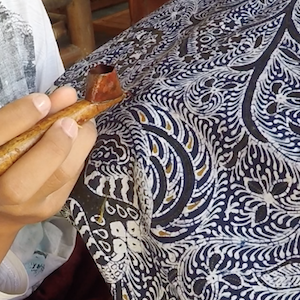 During the session, we will go through the basics of the process, motifs and uses of batik. You will have a hands-on experience with two traditional methods of applying the dye-resisting agents onto the cloth. By the end of the night, you will be an expert who can pick out the “real” batik, take care of your collection and even do a DIY batik art at home! Tony is the workhorse behind aNERDgallery, Singapore’s first art platform specializing in textile arts with a focus in Indonesian Batik. Through the nerdy looking glass, we aim to connect artists and collectors to decode and to understand the rich culture, technological development and historical significance of this ancient art technique. aNERDgallery is an art gallery with a fun, engaging and informative twist. Check them out @aNERDgallery.